Holding 48 standing adults or children in twelve 4-person gondolas, this 20m/66ft diameter HUSS monster holds a commanding presence as one of the best standup gravity ride sensations around. UFO was never quite as popular as the Enterprise with approximately 15 units in existence mainly in Europe, two in North America, one in Sth Africa America and one in Australia. There is a “UFO” called Wild Nightmares at Canada’s Wonderland in Toronto. It is still operating. Looks like a great ride. 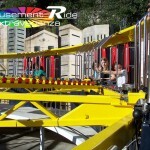 Unfortunately this ride is not yet in the United States. 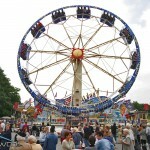 I rode one in the UK years ago while on a coaster tour and really enjoyed the ride though it wasn’t as scary as the original Hrubetz Round Up popular in the ’60s. Being totally enclosed took some of the fear factor away. Went on the UFO last week in Gold Reef City, South Africa. It is still a great ride! Correction to Bruce’s response (#3 above). Darien Lake, located outside of Buffalo, NY, has a UFO. It is one of my favorites there. kkkkkkkkkkkkkkkkkk I liked the name!! There is one in the USA. There is one at Darien Lake Park in Darien Lake New York. Does anyone remember this when it was at Darling Harbour in Sydney around 90-91? 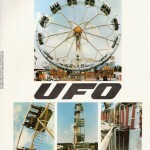 Also ive heard the UFO was at the World Expo in Brisbane 88…does anyone know where I can get some pics of it from the Expo? i rode this!!! at lake winnie except it was called the genie!!! when it is straight up and you are laying down like it feels like your head weighs like 1000 pounds. PS. the one i rode the only seat belt you were wearing was a little chain just loosley laid over your stomach!! it felt very strange but at the same time it felt aweosme!!! There was a UFO in the US at Long Island’s Adverntureland back in the late 80’s. It’s like the Round Up on steroids. 90 Degrees? That creature looks unsfae and..fantastic. Does anyone know of the u.f.o. ride that was popular in the 70’s? It had enterprise-like cars. It spun horizontally around an axis, like the enterprise, but then was pulled over an arch-like half circle – spinning riders upside down and then ending up on the other side of the arch. At Canada’s Wonderland I really like riding Nightmares. I like it how you are stuck to the wall while facing the ground at a 90 degree angle. Completely awesome! One of the best flat rides I have ever been on. It’s been running for over 32 years now (since 1981). 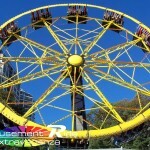 The UFO at Luna Park Sydney has been removed from the park. Not sure why. I wonder if it has been relocated or sold?? Cas, The UFO at Luna Park Sydney unfortunatly had reached the end of it’s mechanical life. It was removed and taken apart in 2013.